This oversized cardigan is the latest style. It is the most comfortable, warm and striking cardigan for any fall or winter wardrobe. 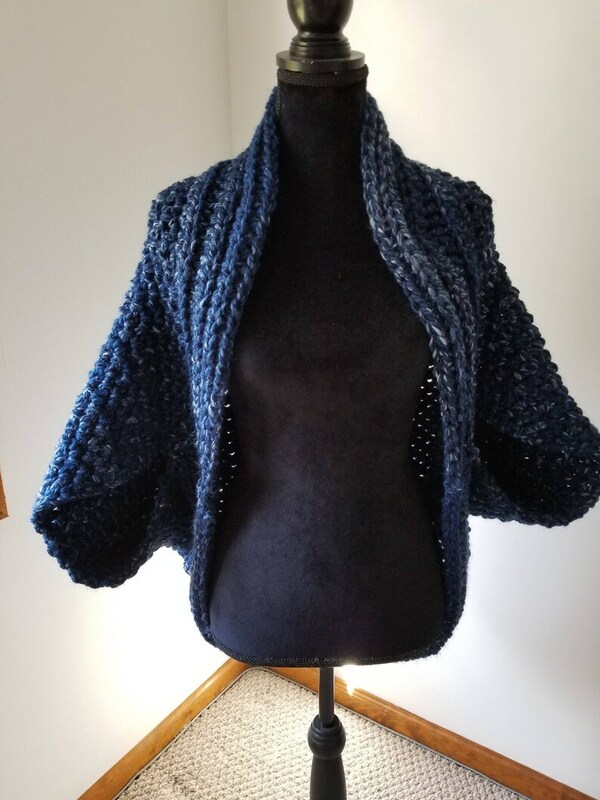 A luxurious super bulky wool/acrylic yarn in a blue tweed was used to crochet this comfy sweater. It is super warm, cozy, and comfortable! So comfortable, you will feel like you are wrapped in your favorite blanket. Perfect to wear while running errands or to keep warm in your home. One size fits most. This is a super bulky (thick) yarn. So I think if you prefer the sweater very loose it will better fit small or medium women's sizes. As a very warm sweater shrug, it will fit small through large. When piece is laid flat, end of arm to end of arm measurement is approximately 36”. Top of neck to bottom of piece is approximately 33”. Piece stretches downward when worn. This is a custom item. The blue sweater pictured is sold, but this yarn is available in a variety of colors. Please send me a convo, if you would like a different color.